Oxford County vital records are process threw Maine vital records office or online with VitalChek. To obtain a certified copy of a birth record, death record, marriage record, or divorce record certificate, visit Department of Health and Human Services for Maine Government to get the physical office address for the Maine vital records department. Or you may call and make your request at 1-207-287-3181. Ordering online with VitalChek takes about four weeks to process, complete your request form online at VitalChek. 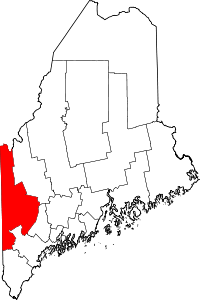 Note: Files in this office include West District: Stoneham, Stow, Lovell, Fryeburg, Brownfield, Denmark, Porter and Hiram. Note: Files in this office for all towns except the following: Brownfield, Denmark, Fryeburg, Hiram, Lovell, Porter, Stoneham, Stow, and Sweden.